E2B v1.54 will support the new .imgPTNAUTO file extension. This differs from the .imgPTN file extension in that the user does not see the prompt to press a key to switch to the new partition; instead as soon as you select the menu entry, the partition is switched and you are immediately presented with the CSM menu. You can also use set AUTOCSM=1 in a \_ISO\MyE2B.cfg file to make all types of .imgPTNxxxx files auto-run to the CSM menu. The new QRUN.g4b file that supports this is available for download in the easy2boot Alternative download areas (see V1.54Beta.zip file). Nearly all modern computers support Network Booting (aka PXE booting). You may have seen the option to boot from the network listed in the BIOS boot options of a BIOS Setup menu. 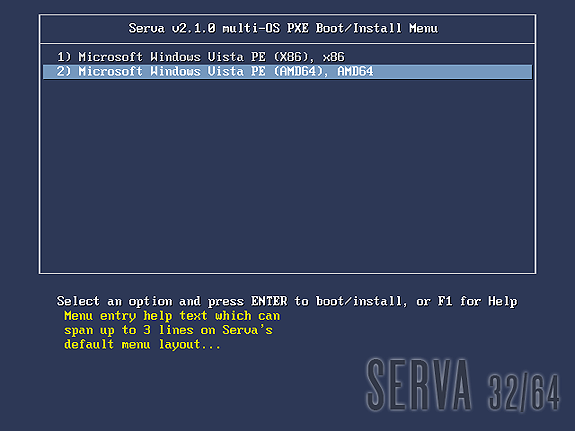 Tutorial #76 on my RMPrepUSB site describes how to set up SERVA which is an incredible Windows utility which can set up any Windows system to function as a PXE server (as well as a normal PC). Normally, you would need to have access to the network DHCP server (the one that dishes out IP addresses to all the computers on the network) in order to configure PXE booting. The unique thing about SERVA is that you don't need to fiddle with the network DHCP server at all. This is a real boon for home users who usually use their router as the DHCP server. It is also a boon for companies who have a multi-server network and don't allow or want their employees to fiddle with the servers. The home site for SERVA is here and it has lots of documentation on how to boot loads of different OS's - see here for a list of non-Windows payloads that you can network boot (includes Fedora, Ubuntu, Kali linux, Debian, android x86, GParted and even FreeDos for performing a BIOS upgrade). To install Windows across the network, it is necessary to ensure that the OS you are booting to has the necessary network drivers included, because once it boots to the Windows PE environment, it will need to pull the install files across the network from the SERVA PC to copy onto the systems hard disk. The free 'Non-Supporter' home-trial version of SERVA can be used to install Windows across the network. The 'Supporter' version is 29.99 and has more features and is used by many companies - see here for a list. Something to try during the Summer holidays perhaps? Jamil recently contacted me and asked how to get the Cold Boot Attack (video) (skip to the 3 minutes point to save time) code 'scraper.bin' to work on an Easy2Boot USB drive. This allows you to capture the contents of a computer's memory onto a USB drive (even if it has been switched off for several seconds!). The idea is that the computers memory may still contain un-encoded AES encryption codes, passwords, etc. which can be deciphered later, once the memory's data has been safely captured. Note that scraper.bin also displays the last key presses from the keyboard buffer too! The idea that we came up with for getting this to work with Easy2Boot is now available for all to use, so check out Tutorial 124! Of course, you need to be able to USB-boot from the system and so you will need to know the BIOS password of the target system (so you know how to protect against this type of attack ;-). 8. Tom analyses the data, gets all the encryption keys and saves the world! Floppy disk images usually have the .ima or .img file extension. You can just add these to your E2B USB drive in the usual way by drag-and-drop to any suitable menu folder (e.g. \_ISO\MAINMENU or \_ISO\DOS or \_ISO\UTILITIES or even \_ISO\LINUX, etc.). Most people will want to boot to DOS (either FreeDos or MS-DOS) in order to run a DOS utility such as a BIOS update utility or a DOS utility such as HWInfo. The RMPrepUSB Tutorial 33 includes details on how to make such Floppy Disk Images. When Easy2Boot boots from a .ima or .img image, the USB drive will be mapped as a floppy disk device (i.e. A:). Any hard disks that are present in the system will appear as C:, D:, etc. but of course, the files on them will only be accessible to DOS if they are FAT16 or FAT32, unless you also have a DOS NTFS driver loaded. The whole floppy disk image is loaded into memory so that you cannot change the files in the image file accidentally (note: if you wish to boot directly so that you can change the contents, use a .IMArw file extension as in v1.54 and later versions). 1. Download the latest DOS version of HWInfo and unpack it fully. 2. Download the FREEDOS_288.zip file from Tutorial 33 and unpack it to obtain the FREEDOS_288.ima file. 3. Mount the .ima file using WinImage or ImDisk. 4. 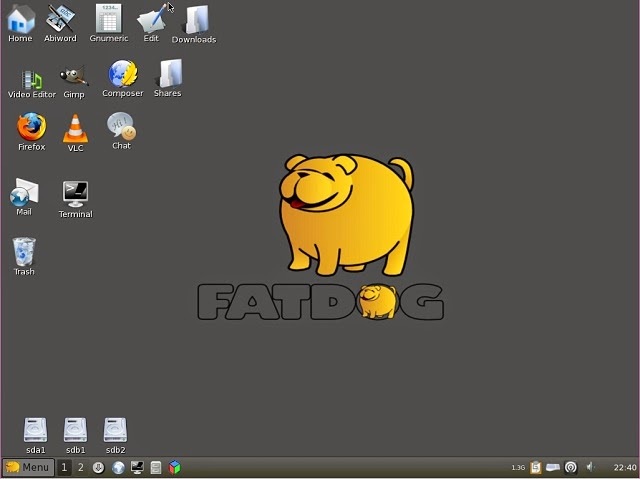 Copy the two HWInfo files (.exe and .dat) to the floppy disk image. 5. Quit WinImage/ImDisk and save the changes. When you boot from the image, type HWINFO at the A: DOS prompt to run the program. If you prefer, add HWINFO to the bottom of the \fdauto.bat file to make it run automatically. A ready-made payload file HWINFO.IMA.GZ is available in the Alternate Download - Other Files areas. There is also a CPUINFO.IMA.GZ too. You can add BIOS utilities in the same way. If you use the .ima file extension, the USB drive will be accessible from DOS as the first hard disk in the system. Any internal hard disks will be the 2nd, 3rd, 4th etc. Of course, FreeDOS will normally only be able to access them if they are FAT16 or FAT32. If you need a larger image, use ImDisk to create a Dos.img file of whatever size you want as a virtual drive. Copy your files onto the virtual drive and then 'Remove' the virtual drive. Then copy the Dos.img file to \_ISO\MAINMENU. If you like, you can use the contents of RMPrepUSB's FREEDOS_USB_BOOT folder as a source for your bootable FreeDos files (press F3 in RMPrepUSB to see the folder). I have added Tutorial 123 to the RMPrepUSB site for anyone wanting to re-install linux onto their Asus EeePC 701 from a USB drive using the 900MB EeePC 701 ISO download. The larger EeePC downloads (e.g. v1.7 1.9GB) include images for many more EeePC models which can be run Live or can be installed. These larger ISOs can simply be added to your E2B USB drive as .ISO files. See Tutorial 123 for more details. You can download various versions of 64-bit android for different Intel platforms from here. Note that these are Betas and so I would recommend you do not try to install it onto your working Windows system! Luckily, most images contain a Live boot option so we can test it out without installing it. The downloads are in the form of .zip files and contain a disk image which can only boot via UEFI. Use 7zip or WinRar, etc. to find the live.img payload file which will be inside the .zip download file, e.g. android-4.4.2_r1-ia1-haswell_generic-userdebug.zip has a live.img file under \out\target\product\haswell_generic. I picked this one for my Z87 Haswell system. Extract the live.img file from the .zip file file to a temporary folder (e.g. C:\temp\live.img). Now you can boot in MBR mode (or use QEMU or VBOX) and select the new .imgPTN file to swap over the E2B drive to the new partition image and then go and UEFI-boot it from the correct Intel Platform (e.g. a Haswell-based system in my case). Note that UEFI booting from VBox will probably fail as it will refuse to boot from an incorrect CPU\chipset platform. You can run android x86 on an Intel\AMD x86 system from an ISO with persistence directly from your E2B drive. 1. Download a suitable version of Android x86 as an ISO file. Note that you can obtain versions to match different systems (e.g. eeePC, etc.). Using the wrong version on some systems may result in problems with the mouse or touchscreen, etc. 2. 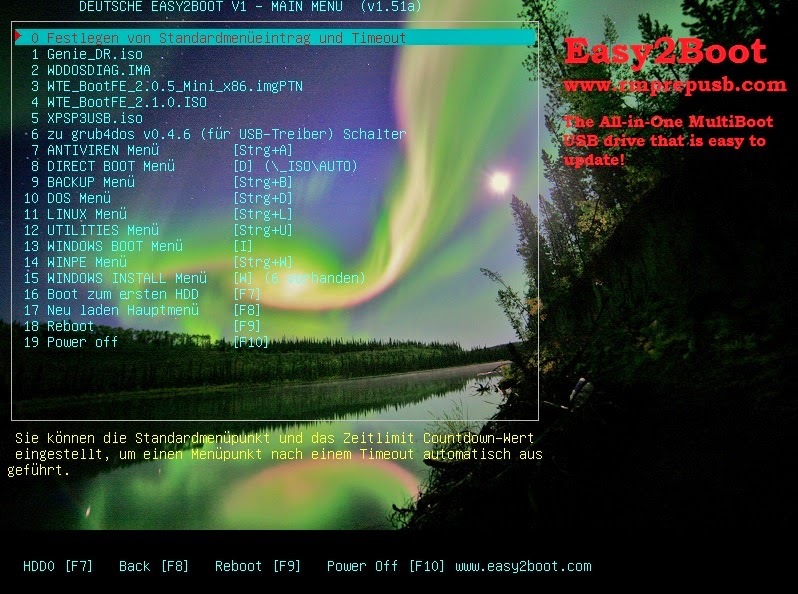 Copy the ISO file to a MNU folder on your E2B USB multiboot drive (e.g. \_ISO\MAINMENU\MNU or \_ISO\LINUX\MNU). 3. 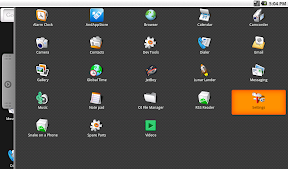 Copy the android_x86_Persistent.mnu file to the same folder as your Android ISO file. Then Edit the .mnu file so that the ISO filename matches your ISO filename. 4. Create an ext2 file in the E2B root (top level folder) using the RMPrepUSB - Create ext2 FS button - the file name should be \android-rw, but the volume name and size can be whatever you like. 5. Make all files contiguous using RMPrepUSB - Ctrl+F2. You can find the android .mnu file in the Alternate Downloads area (link on this page) or in later versions of E2B in the \_ISO\docs\Sample mnu files folder (1.54 or later). Note that for persistence, we must specify the linux drive name in the kernel parameters. The .mnu code tries to calculate this, but you can override it by typing in the correct letter if it guesses wrongly. For instance, if you boot from your E2B USB drive on a laptop containing a single HDD, the .mnu file will guess that the USB drive will be 'sdb' once android boots - if this is incorrect, and it will actually be 'sdc' then just type c followed by the [ENTER] key when you are prompted by the E2B menu. If you don't type anything within 2-3 seconds then it will just use the calculated value. If the drive letter is wrong, you just won't get persistence! Tip: You can tell what drive letter the E2B USB drive is as android boots. If your mouse is not working in android x86, use the TAB, ESC and ENTER keys as well as other keys to navigate the menus and icons. Note: I had a few problems booting some of the ISOs in 'Resident' mode on some systems, but the Guest mode seemed to work. Android_x86 also did not seem to like VBox virtual machines much! 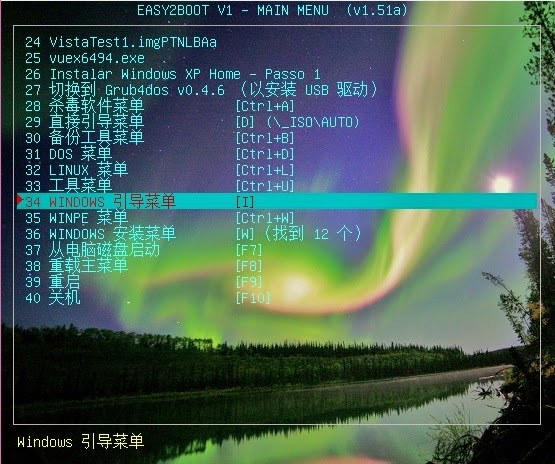 You can also try the E2B Grub2 menu system which can boot to PhoenixOS via UEFI&MBR 32&64 and remix via UEFI&MBR 64-bit. I was recently contacted by 'JFL' about getting Windows8ToGo working on his 64GB SanDisk Extreme flash drive. He was using Windows 8.1 Enterprise as the source and was following my earlier blog here. The problem was that although he could install Windows OK, it would not boot. His SanDisk Extreme was listed as being of the Removable type in RMPrepUSB and it was suspected that this may have been the problem because I found some comments from madscye and creosotechris here which sounded suspiciously like something has changed in Win8.1! Now, in the past, I have had Win7ToGo booting from a USB removable flash drive OK many times. I have also booted Win 8 in the past on a removable USB Flash drive and that had worked OK. I already had a 21GB Win8.1ToGo.imgPTN file which I made earlier on my E2B USB HDD and I copied that onto my 32GB USB 3.0 Corsair GT E2B Removable-type drive (after deleting some ISOs to make room!). I switched partitions using E2B and then I ran BCDBOOT on it to set the BCD correctly to boot from the different drive. Result: it booted fine under VBox (which treats the USB drive as an HDD) but NOT on my Acer laptop (ever-lasting spinning circle of dots!). 2. Boot from the Lexar USB drive on an Acer Aspire 7741G laptop - go through user setup to Desktop (again very slow!). 3. Reboot and check boots from USB drive OK - all was working fine. Result: The Lexar boots just fine! So proof that Win 8.1 ToGo must be run from a Fixed-disk type of USB drive! [Update] Win10 (first release) also has same issue. It can be overcome by booting from a VHD file containing WindowsToGo. Windows 10 Creator now allows us to use Removable or Fixed disk USB drives for flat-file booting - hurrah! In the last few days there have been a few small changes to E2B. E2B v1.53 - has TRAD_CHINESE language added (thanks to Andrew :-). It also has a bugfix to the Make_E2B_USB_Drive.cmd script which used the wrong version of grub4dos to install code to the MBR of the E2B USB drive (reported by JF-L). This did not cause a problem unless you tried to boot a .imgPTN file - then you would get an error from E2B Qrun.g4b complaining about 'No Grub4dos installed to the MBR of this drive!' I have now changed the script and also changed Qrun.g4b so any version of grub4dos MBR code can be used. If you have seen this error message, it can be fixed by using RMPrepUSB to reinstall grub4dos to the MBR of your USB drive (recommended) or by updating your E2B USB stick to v1.53. Info: The version of grubinst.exe used in RMPrepUSB has been modified by me to make it more boot-compatible on a wider range of systems than the standard grubinst.exe (the standard version is called grubinst_new.exe in RMPrepUSB). The boot code in the standard grub4dos MBR does not boot on some systems due to some BIOSes detecting what they think is invalid boot code. The special version of grubinst.exe in RMPrepUSB is limited to installing grub4dos to drives numbered 0-9 only, but fixes this problem, so that these few weird systems will also boot to grub4dos. That is why I recommend you always prepare your E2B USB drive using RMPrepUSB or the Make_E2B_USB_Drive script (and for other reasons too, like FAT32 writes are up to 10% faster on a flash drive if you use RMPartUSB to format them!). The other update is to the MPI Tool pack - MPI_Tool_Pack_Plus_CloverLite_035. This has been updated to version 035a. It has the latest version of ImDisk now. Also, there was a problem if you tried to run 'RestoreE2B (run as admin).cmd' from Windows Explorer by using right-click+Run as Admin AND if you had not installed RMPrepUSB into it's default location on your Windows system (reported by Anderson - thanks!) - this is fixed in the new version. P.S. No more language files have been sent to me yet - why not achieve some small amount of fame and world gratitude by translating the E2B strings.txt file into your own language? Instructions are in a previous blog post here. You can even use Google Translate to do most of the grunt work! If you are German or Spanish speaking, please can you check the existing STRINGS.txt files as there are probably some errors as I used Google Translate to make them! Mr TSAI has kindly sent me a Traditional Chinese language file. The latest languages will always be in the E2B_LANGUAGE_PACK.zip file located in the Easy2Boot Alternate Download areas. Memoarfaa has confirmed that the @DED-LEGO@ GFX menu package works with E2B - see the reboot forum posts starting here. You will need to increase the default number of entries from 15 however by re-compiling the file (why not try 100?). @DED-LEGO@ showing the E2B menu with walking penguin and animated clock, etc. Please note: E2B does not fully support GFX Menus or @DED-LEGO@/RIPPER menus and I am only willing to spend a few minutes on any issues/questions you may have concerning these. The Spanish and German STRINGS.txt files probably need some corrections. If you see any problems please just modify the STRINGS.txt file and send me the new version. I have tried to convert E2B into German even though I failed my German O-Level! If you speak German, please you can check my translation by downloading the German STRINGS.txt file and copying the STRINGS.txt file to your Easy2Boot \_ISO folder. 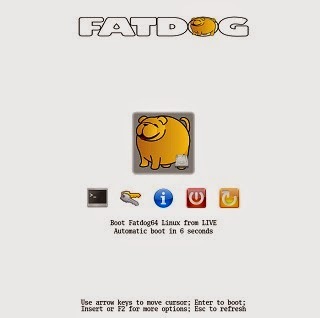 This file is already in v1.52. I expect there are some issues - if so please just edit the STRINGS.txt file and test it. Then email me the corrected version! Use E2B v1.52 to test it. 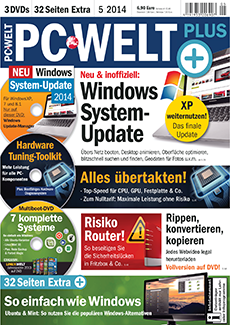 Don't forget to test the XP, Vista and Win8 installs to (you can use a dummy ISO file). Note: first version had a $$STRl1x1 problem when loading Windows Install menu - please re-download the corrected version if you have the old version. To make a STRINGS.txt file in your own language, see the previous blog for instructions. Mr Lin has translated E2B v1.51 into Chinese. The new STRINGS.txt file is available on the E2B Downloads page and will be added into the next version of E2B. If you would like to translate E2B into your own language, just make a new STRINGS.txt file. Please send me your new STRINGS.txt file and I will add it to E2B and your fame will be immortalised! 1. Copy the \_ISO\e2b\grub\ENG\STRINGS.txt file to the E2B drive's \_ISO folder - always use latest BETA version of E2B (do not use an earlier version). 2. For test purposes - ensure that there are ISO files in all E2B menu folders - the ISO file can be just a one-byte dummy file (e.g a small .txt file renamed to dummy.iso). It is easier to use dummy files because they won't boot and will just return back to the E2B menu again. \_ISO\ANTIVIRUS, AUTO, BACKUP, DOS, LINUX, MAINMENU, UTILITIES, UTILITIES_MEMTEST, WIN and WINPE folder. Also add an ISO to each of the folders under the \_ISO\WINDOWS folder so that the Windows menus will appear. Ensure there are two or more ISO files in the XP folder (if only one ISO then it will be automatically selected by E2B and you may not see all the dialogue strings). 3. Boot from the E2B stick using an emulator\VM - if using RMPrepUSB and QEMU - use CTRL+SHIFT+F11 (not the F11\QEMU button) - if using VBOX - do not use DavidB's VMUB. This allows you write access to the USB drive without needing to quit the emulator/VM each time you make a change. 4. Load the \_ISO\STRINGS.txt file into your favourite text editor (e.g. Windows NotePad) - ensure that it supports UTF-8 format so you can save non-ASCII characters. 5. Edit the English text on the right-hand side of all the $$STRxxx= keywords and change it into your own language. Tip: You may find it quicker to upload the English Strings.txt file into Google Translate and cut and paste the translated text back into your STRINGS.txt file. 4. Double-Click on the FIXLANG.CMD file to fix the errors. A NEW.txt file will be made and then loaded into NotePad. You can re-save it as STRINGS.txt if it looks better. FIXLANG.cmd will fix many of the problems caused by Google translate but you will still need to check each line carefully. I recommend using WinMerge to compare the new NEW.TXT file with the original English STRINGS.txt file. To replace strings in more than one file, I recommend 'Find and Replace' (FNR.exe). FNR is a standalone .exe. It allows you to preview results before you change any files. 7. Hit F9 in the E2B emulation session to reboot E2B - the new changes should now be visible. 8. Go through all the menus and also all the XP and Windows Vista and Windows 8 install screens (you can use a dummy ISO file for these). 9. GOTO STEP 5 and repeat until it is all perfect! This is the hardest and most time-consuming part! You will need to check each line carefully, especially any \n syntax and file paths such as \\_ISO\\AUTO. Check all $$STR keywords and any $ colour strings have not been corrupted. Also, any question which requires a Yes/No answer must keep the same letters because E2B will expect either the 'Y' or 'N' key to be pressed - e.g. Ja/Nein (Y/N) is correct, but Ja/Nein (J/N) may not work because E2B is expecting 'Y' not 'J' for Yes. Any string that starts with a ^hotkey symbol must not be translated - e.g. because grub4dos hotkey names are coded keywords. You can change the letter from A to something else but don't change ^Ctrl+. Some headings are underlined using ===== , e.g. The number of = characters must match the number of characters in the heading - e.g. The heading (XP-Installation - Schritt 1) has 27 characters and so there must be 27 = signs for the underline. Finally - contact me and let me know what language and locale it is (e.g. Spanish, Catalan, Portuguese-Spanish, etc.). I will reply by email so you can email me the new files. Also you can translate the F1.cfg file too if you like! Really easy to see what is taking up the space on a disk and easy to use too. I have had three reports from users recently complaining about the Step 2 XP Install stage not working. When I looked at the XPStep2.g4b file, I found that I had accidentally commented out the line that loads the XP ISO into memory! The bug existed in all versions between v1.32 and v1.51! This has now been fixed in v1.51a. This probably explains why there have been some complaints (it is not always necessary to load the ISO into memory, but in helps in cases where XP does not contain compatible USB drivers and so cannot access the ISO file when it boots to XP). I have now documented how you can have multiple wallpaper background bitmaps here. Note: MyE2B.cfg needs 'call Fn.70 3' so you can see the background during file enumeration. See the YouTube video on how to set up multiple menu backgrounds by Liu Evan here. To update E2B, download the non-DPMS zip file and extract the files onto your E2B USB drive - you don't need to download the large DPMS zip file even if your previous version was with the DPMS drivers. Then use the \Update_E2B_Drive.cmd file to update your E2B drive. In case you missed by previous blog about the GEGeek Tech ToolKit here, I just thought I would mention that a new version is now available from the GEGeek website. It is a hefty 1.7GB download but worth adding to your USB Flash drive as it contains hundreds of useful Windows tools and utilities. Click on the GEGeek Tech Toolkit link to get to the download. English strings.txt file is now always loaded after primary language. The main change is Item #1 - so that you do not have to rename .imgPTN files to the more compatible/reliable files extension of .imgPTNLBAa, I have now made these two file extensions both behave as .imgPTNLBAa did (i.e. both file extensions now modify the partition parameters for LBA access and set the partition as Active). If you don't want the partition set to Active and you don't want LBA parameters to be used (i.e. the 'old' .imgPTN behaviour) then use the new file extension of .imgPTNna (na=non-active). Change #6 - This ensures that if a $STRxxxx string is missing from the chosen language file, then the English version will be used instead. Thus, if a new $STRyyyy string is added at some later date to the ENG\STRINGS.txt file, the old Spanish strings.txt file (which will not have the new $STRyyyy string) will not report an error but will just show the English translation if the Spanish translation is missing. i.e. the 'fallback' string translation will be English as I can always keep this up to date. You may have read recently that the European Court of Justice passed a ruling that search engines should not return any results that are inaccurate, inadequate, irrelevant or excessive (see here for the details). Note: if someone asks for a search result to be removed because it is 'irrelevant', then surely it cannot actually be irrelevant because is it was irrelevant then they wouldn't be asking for it to be removed! i.e. Catch 22! 1) What is the case about and what did the Court rule? In 2010 a Spanish citizen lodged a complaint against a Spanish newspaper with the national Data Protection Agency and against Google Spain and Google Inc. The man complained that an auction notice of his repossessed home on Google’s search results infringed his privacy rights because the proceedings concerning him had been fully resolved for a number of years and hence the reference to these was entirely irrelevant. He requested, first, that the newspaper be required either to remove or alter the pages in question so that the personal data relating to him no longer appeared; and second, that Google Spain or Google Inc. be required to remove the personal data relating to him, so that it no longer appeared in the search results. While the Court ordered Google to delete access to the information deemed irrelevant by the Spanish citizen, it also emphasised that the content of the underlying newspaper archive should not be changed in the name of data protection (paragraph 88 of the Court’s ruling). The Spanish citizens’ data is still accessible but is no longer ubiquitous. This is enough for the citizen’s privacy to be respected. So a Citizen can deem some piece of information about himself is 'irrelevant', it is perfectly OK for the information to be present as an article on the web, it is not breaking any law, but we (the public) are not allowed to search for it! Because of the data protection act, the source should not be changed, but the Search sites which can find the source sites should be changed. Surely this is circumventing the data protection act? Recently a British journalist queried why some of his article 'hit results' were removed by Google after receiving a letter from Google telling him that they would be omitted in future due to the ECJ ruling and a request from 'some 3rd party' to do so. In other words, someone just filled in a form provided by Google and they removed the search results. They recently reversed this decision (see here). I simply cannot understand why the entire world internet population (and Google) has not objected to this? The ruling says that even if the 3rd party provider (e.g. Google) has servers outside Europe, the rule still applies as long as the 'service' is made available to Europeans. The fine for not removing these results is pretty massive (up to 2% of annual worldwide turnover - note the word turnover - not profit or net income but turnover!). And that is just for 1 result being returned when it shouldn't be. So Google 'detects' a European I.P address and censors our results (if using google.co.uk for instance). So we can look forward to loads of non-European server sites acting as Google proxies for Europeans who want to do Google searches and see ALL results. Apparently, Google have had over 50,000 'please forget me' requests so far! OR just use DuckDuckGo which is also anonymous and does not take into account who you are or what you have been searching for recently. Here is another more local case of why this ruling is insidious (and doesn't even achieve it's objective anyway) from my local press! So you can get past crimes that you committed just 8 years ago 'expunged'. If a man was taken to Court in 1979 for child abuse but was found innocent (or even guilty! ), could he later (how much later?) get the search results for that Court case removed? What if 20 different children or adults accused that same person of abusing them over a 20 year period between 1978 and 1998 but no further action was taken due to lack of evidence - could he also get these results removed by Google and the other search engines? According to the ECJ, he could as they are 'irrelevant'. How would that affect your decision about whether to believe your child and whether your child and other children were in danger from this man and whether to go to the Police? What message is this sending to society? Go out into the world and commit crimes, disappear for a year or so, get the crimes removed from all the search engines and no one will know. You are then free to commit more crimes and only when you are caught by the Police (or your employer bothers to do a Criminal Records Bureau check) will they realise you had former convictions. Surely this ECJ ruling has been taken too far? If it is allowed to go on, then we can no longer rely on Google to give us accurate web search results. In that case, maybe we should start using a different search engine that doesn't respect the ECJ ruling (or rather, is not afraid of being fined by it)? If a web site is hosting some dubious content, and it is proved to be breaking the law, then the host site should be prosecuted not the search site - i.e. 'don't shoot the messenger'!